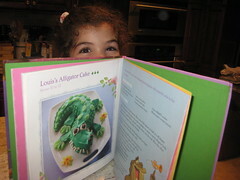 My daughter’s fifth birthday was coming up and for her party, she asked that we bake a Louis the Alligator cake. Louis, as in the big, jazz playing alligator from the Princess and the Frog. A cake. Me, bake a cake. For her birthday party. For many many people. And not just any cake. No, of course not. 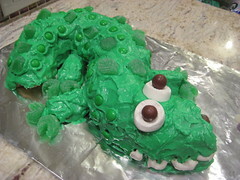 A green alligator cake, with goofy eyeballs and green m&m scales on his tail. Nitza sure doesn’t do alligator cake. But she does do Cake Corriente, or regular, run of the mill, yellow cake. We decided to bake two cakes – just in case. And I quickly enlisted the assistance of my amazing husband, mom, dad, in-laws, and of course, my daughter. After all, it was her idea, so she might as well have to put up with the process. For all you bakers out there, you’ll find the recipe to probably be simple enough. And, for all you bakers out there, please feel free to help me figure out the baking time necessary for this cake, as in writing this blog post, I realized why I had some parts of the cake that were still raw. 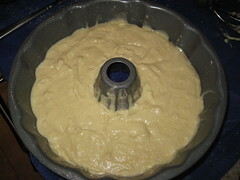 Nitza’s recipe calls for a three-layer cake and I put the whole mix in one bundt pan. Back to the recipe now. You start off by sifting flour, but for some reason unbeknownst to me, she says that you’ve got to sift the flour, before measuring it, without hitting the cup. What? I don’t know. 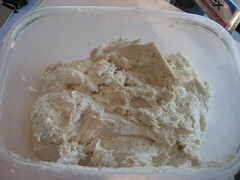 So I measured the flour, baking powder and salt and sifted it. 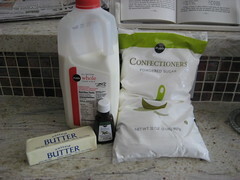 In my mixing stand, I beat the butter until creamy and I added the sugar, a bit at a time. 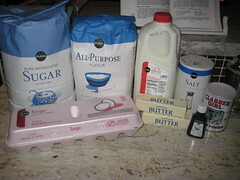 I then added eggs, one by one, making sure that it was well mixed before adding the next egg. 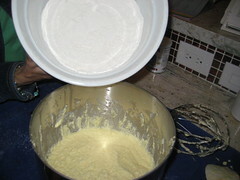 I then added milk and vanilla and it looked like the batter had been cortada, or separated (which Nitza assures you is the right thing that happens), and it came back together when I added the dry ingredients to it. You pour the dry ingredients into the wet, but do not beat them together. You gently mix them with a spatula until well blended, and pour it into three individual 9” round pans that you have greased and sprinkled with flour. Not into a bundt pan, unless you want to make Louis the Alligator and then you need some help with the time. The recipe says 30 minutes in a 350 degree oven is good for the three pans. 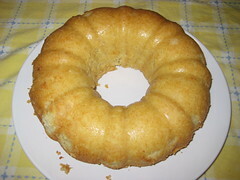 For me, 60 minutes in a bundt pan didn’t seem to cut it, but I’ll take suggestions. And, that green frosting? Well, it was actually another recipe. I was in major production mode. I wasn’t just going to knock out one recipe with this birthday party. If I would have known sooner that buttercream frosting was so easy to make, I seriously may have changed my closed-minded opinions about baking. Butter, sugar, milk and vanilla. All in a stand mixer, little by little. Beat well. Frost your cake. 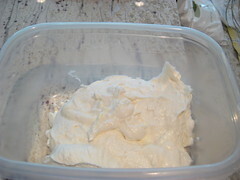 So easy, I decided to make yet another frosting. Heck, everything in the kitchen was dirty already. 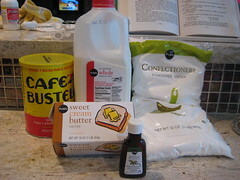 Make Cuban coffee and add it to the butter, sugar, milk and vanilla. Beat well and frost something else you may have baked. Once the cake had fully cooled, I had my master baker step into the mix. My husband really enjoys baking. He’s good at it, also. And, his engineer-type brain was perfect for shaping Louis. 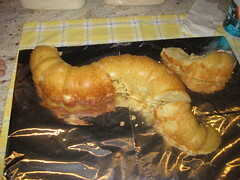 He split the bundt cake into three pieces and arranged two of the pieces into an “s” shape. The third piece, he sliced into two halves, at an angle. Half the piece would be the tail, sloping downward, and the other half would be used to place the four alligator feet. Once that was set into place, we dropped a few drops of green food coloring into the buttercream frosting and mixed it well. It was a perfect shade for Louis and we frosted him perfectly. We used a marshmallow, cut in half, for the whites of his eyeballs and a malted milk chocolate ball for the brown of his eyes. We used green m&ms as scales down his back to his tail and mint gummy leaves as his feet and some more scales. Louis looked like Ed, the loony hyena from The Lion King, more than Louis the Alligator from the Princess and the Frog. But, to my daughter, he looked perfect. And that is all that matters. She was so proud of her birthday cake and that makes me beam inside. Another three recipes down, and another memory tucked away. This is, after all, what matters. Can you please post the actual recipe? Or email it to me?